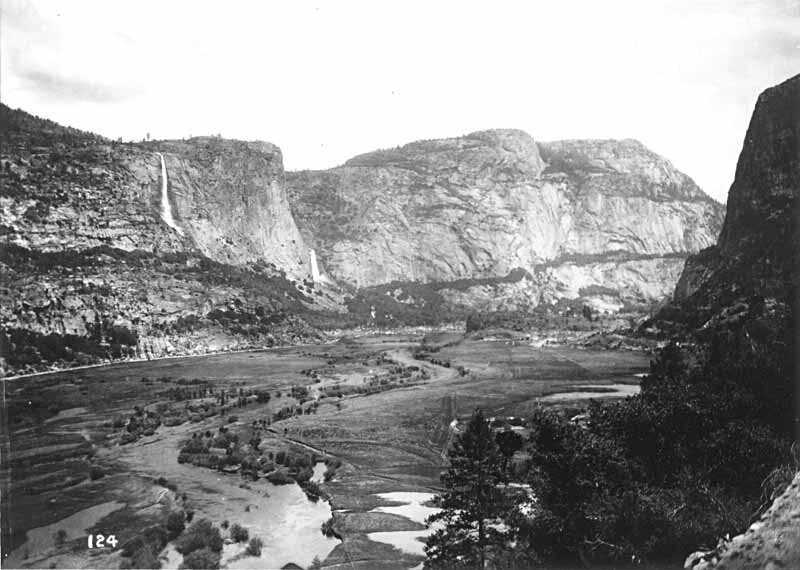 Celebrating Yosemite Part 4 – Hetch Hetchy: The Best and Highest Use? There are few subjects in Yosemite’s history as controversial as the damming of the Hetch Hetchy Valley. Driven by San Francisco’s need for a reliable water source following the 1906 earthquake and subsequent fires that razed the city to the ground, historians often portray the story of Hetch Hetchy as a battle between utilitarian conservationists epitomized by the Forest Service’s Chief Forester Gifford Pinchot and preservationists led by John Muir over what was the highest and best purpose of public lands and National Parks. Despite the Hetch Hetchy Valley lying wholly within Yosemite National Park, dam proponents argued that the valley’s beauty was significantly less important than the its utility as a much-needed reservoir for San Francisco. Muir responded the Hetch Hetchy Valley was “one of Nature’s rarest and most precious mountain temples,” and damming such a treasure would be akin to turning the people’s cathedrals and churches into water tanks (a line of argument later used by the Sierra Club in 1966 in opposing damming the Grand Canyon). After years of contentious debate conservationists won the day when President Woodrow Wilson signed the Raker Act into law in 1913, authorizing the construction of the O’Shaughnessy Dam. While the act determined Hetch Hetchy’s fate, it launched several more conflicts over the development of the reservoir. Specifically, the construction of recreational facilities and who should pay for them. 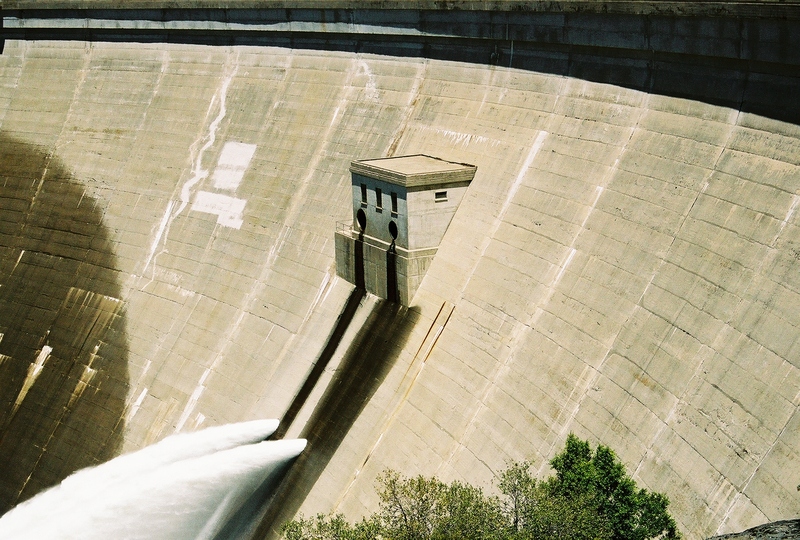 While not entirely supportive of the damming of the valley, Yosemite officials hoped the dam would lead to the further development of recreational opportunities within the park, and thus attract more visitors. Reservoir proponents sold the project as a means to develop a system of roads, campgrounds, and trails in order to better serve park visitors. 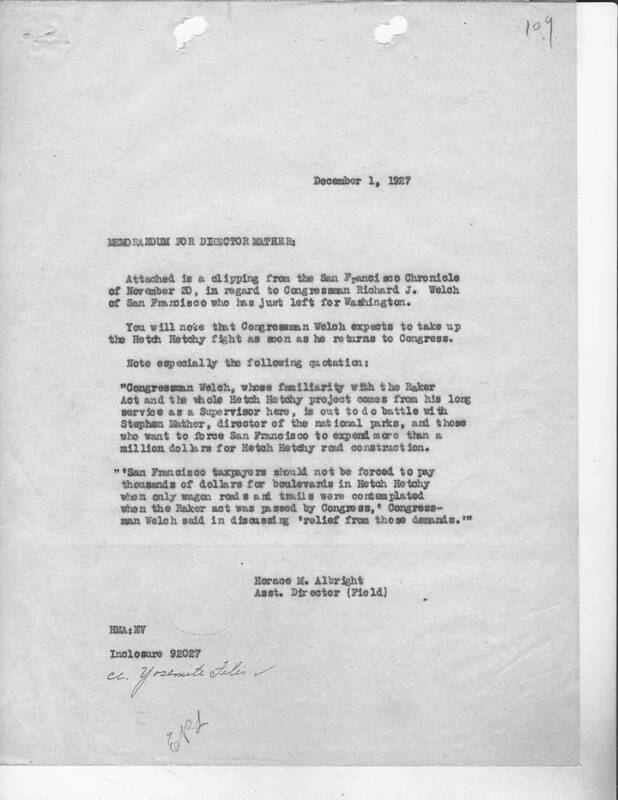 Such a vision appealed to commercial interests who believed the Hetch Hetchy Valley as it existed too remote to be truly attractive to a public increasingly in love with the automobile. If the city was willing to pick up the tab to develop the valley in return for a reliable source of water, then all the better. Under the Raker Act, funding for these roads and trails fell to the City of San Francisco, which obligated the municipality to build any road or trail deemed necessary by the Department of the Interior. City officials agreed to such measures in order to gain federal approval of the dam, but had no intention of following through. Issues arose during the construction of the dam as visitors were bared from viewing the construction site. Claiming safety concerns, the site was closed to tourists until the dam”s completion. Visitors flocked to the area following the O’Shaughnessy Dams in 1923, only to find the narrow Mather–Harden Lake road into remote area dangerous. Yosemite officials demanded the city widen and resurface road. But, in lieu of rebuilding a road through some of the most difficult terrain in the park, San Francisco officials arranged to make three payments of $250,000 to the U.S. Treasury Department. Rather than using the money to improve the Mather–Harden Lake road, Interior officials diverted the funds to expand and improve the much more popular Tioga Road. Citing fears of polluting the Tuolumne River basin, San Francisco refused camping access to the Hetch Hetchy, which led to the establishment of Camp Mather some nine miles from the dam. Additionally, swimming, wading, and boating were not allowed in the reservoir. Growing numbers of park visitors questioned why they should be prohibited to enjoy the lake within the Yosemite National Park framework. 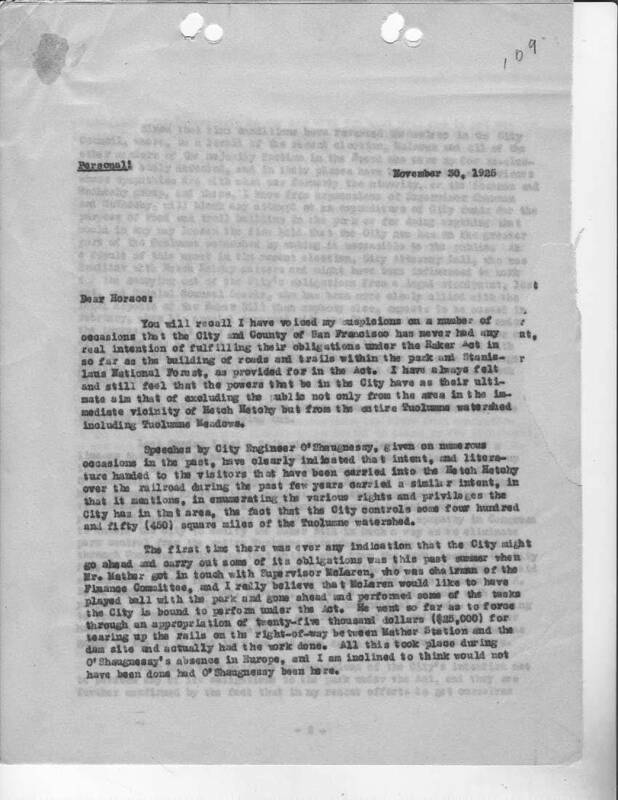 National Park officials (the National Park Service was established in 1916 during the dam’s construction) began to demand that San Francisco live up to its end of agreement outlined in Raker Act and construct the agreed upon trails and campgrounds. 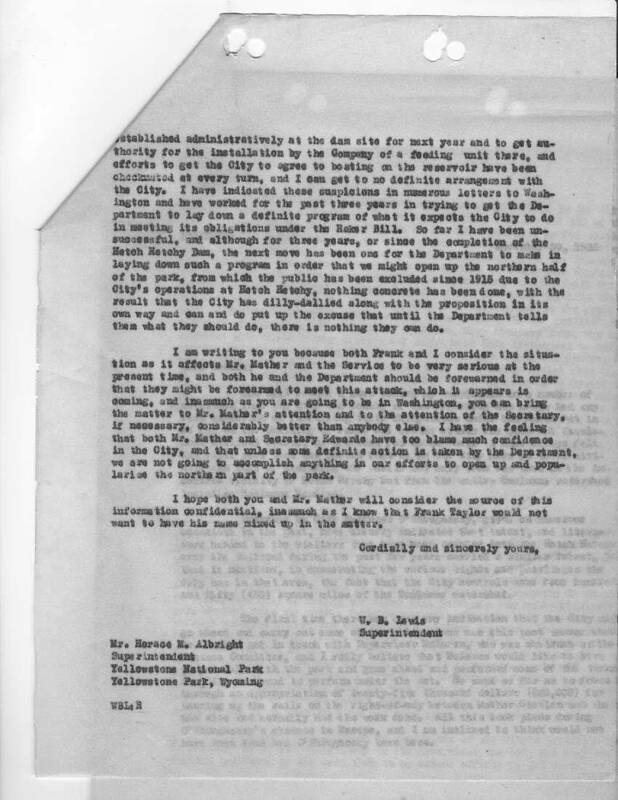 The city continued to dodge of its responsibilities under the Raker Act, straining its relationship with the National Park Service’s Direct Stephen Mather and Yosemite’s Superintendents (See document above) until 1930 when city officials signed an agreement with the Department of the interior in which San Francisco would complete construction of system of trails on the reservoir’s north shore in exchange for the Park Service to take administrative control of the area. The agreement remains in place today. Swimmers and boaters are still banned from using the reservoir, and camping is not allowed within one hundred feet of the shoreline. Few would call the Hetch Hetchy Road to the dam a boulevard, and parking is rather limited. Yet, San Francisco’s water is among the cleanest in the nation. Is such an arrangement the highest and best use of a national park? Or, should we heed calls to restore Hetch Hetchy by removing the dam? The answers to these questions remain as contentious today as they were a century ago. Perhaps it always will when it comes to Hetch Hetchy.